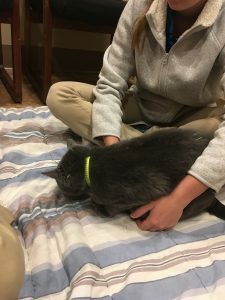 Abstract: Lacey is a resident cat of my clinic who has exhibited intermittent signs of suspected feline idiopathic cystitis for the past three years. 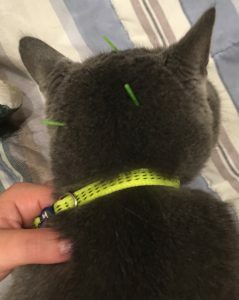 After three acupuncture treatments, she resumed use of her litter box sooner and more consistently, as compared to treatments with anti-inflammatories and antibiotics. 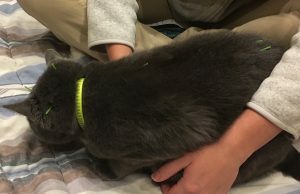 History and Presentation: Lacey is a 9 year old, female spayed Domestic Shorthair who is the resident clinic cat. She is allowed to roam free through the clinic, willingly jumps on counters, and has visual access to all small animal patients and clients. Personality-wise, she is friendly and affectionate towards staff and standoffish towards clients; she will often sit on the front counter where all pets can see her. She allows petting of her head, shoulder and back, but is protective over her hind quarters. She has been used as a demonstration model for teaching moments, and is very resentful of any type of restraint. Lacey is on Prescription Diet c/d Stress free choice for recurrent cystitis and urinary tract infections, with her last diagnosed infection occurring in February 2017. She has been treated in the past with non-steroidal or steroidal anti-inflammatories, and with different antibiotics when dictated by urinalysis. Lacey typically has one to three bouts of inappropriate urination during each flare-up of her cystitis once starting treatment. On October 25 and November 7, 2017, the patient urinated in a sink. A urinalysis was performed both times and showed only inflammatory changes. She was diagnosed on December 6 with mild otitis externa bilaterally and was treated with a topical daily ear cleanser and a topical antibiotic/ antifungal/steroidal anti-inflammatory ointment. She continued to carry her ears slightly lowered after her week’s treatment was finished. Physical Examination and Clinical Assessments: Lacey has a body condition score of 6/9. Her genitourinary system is within normal limits on gross appearance. No conscious proprioception or cranial nerve deficits were noted. Her cardiovascular, lymphatic, integumentary, digestive, and musculoskeletal system are within normal limits. Mild dental calculi were noted along her maxillary molars. Ear canals were clear of any debris and tympani were intact bilaterally post-treatment for otitis externa. 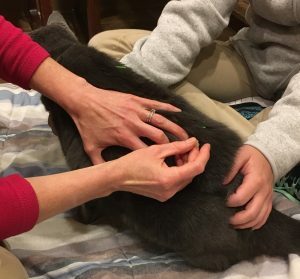 Myofascial palpation showed bands of tension in her cervical region and along her lumbar and caudal spine; the patient vocalized and moved away with gentle palpation of her hind end. Medical Decision Making: Given Lacey’s history of a stressful environment with a constant flux of animals and people into her space, my goal was to target the autonomic nervous system to increase her parasympathetic tone to reduce the physical effects of stress and tension. Specific points were chosen along the Bladder (BL) line, as the interaction with the collagen fibers and extracellular matrix directly communicate with the spinal nerves that regulate the parasympathetic arm of the autonomic system. These points increase the release of neurotransmitters like norepinephrine and serotonin to stimulate the release of endogenous opioids and endorphins to reduce the perception of pain, and to change the body’s heart rate and breathing patterns. The second goal was to target the points specifically associated with cystitis. These pertinent points target the nerves that innervate the kidney and bladder, as well as the muscles of that region as they arise from the same spinal segment. 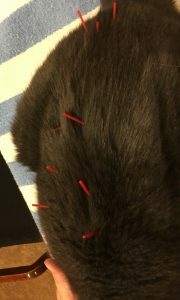 The cat’s personality dictated a shorter session with fewer needles. Ideally, BL 28 would have been utilized all three sessions, but she would not allow more than one set of points around the sacrum. 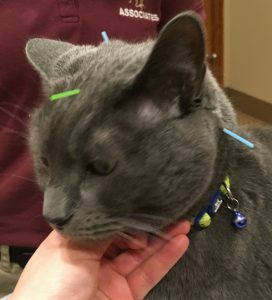 She tolerated food as a distraction for a few minutes, but for the second and third session, she was very limited on what needles I could place and for how long they stayed in. 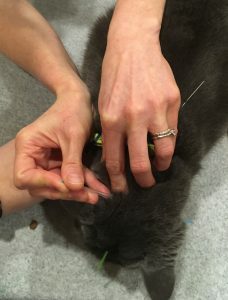 Differential Diagnoses: Based on the cat’s housing environment and previously diagnosed lower urinary tract infections, a recurrent cystitis versus urinary tract infection was suspected. 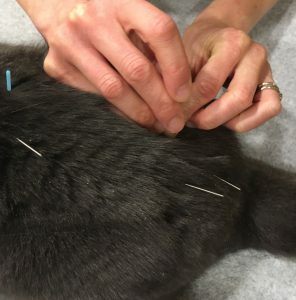 Definitive (or Putative) Diagnosis (or Diagnoses): Feline Idiopathic cystitis secondary to stress is the diagnosis, based on the urinalysis and the patient’s return to normal litter box use after each acupuncture treatment. 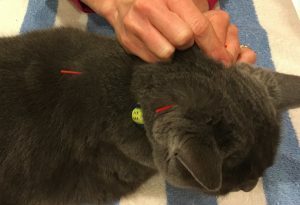 Acupuncture Treatments: The goals for treatment were to mitigate some of the effects from the daily stress in her environment, and to reduce discomfort associated with a mild bilateral ear infection for the last session. For all sessions, Lacey was crouched on her feet which made her hind legs inaccessible without disruption or her showing signs of leaving. I chose the following points for all three sessions: BL 10, Bai Hui, and Governor Vessel (GV) 14 for relaxation and tension. I also chose BL 23 for more local effects on the urinary system and local strain patterns. Additional points for the first session included GV 20 for relaxation and BL 28 for the Bladder shu/cystitis. In reviewing my photographs after the session, I realized the positioning of BL 28 was actually closer to BL 27, and that I needed to be more accurate in palpating her to find the proper point. For the second session, I added in points BL 21 and BL 25 for local tension along the back and the correct BL 28 for cystitis. I attempted to add in GV 20 and more points for cystitis (GV 4, BL 27 and BL 52) but those attempts were not well-received; she would move away with palpation, or shake and cause the needle to dislodge immediately. For the third session, I had more luck with the GV 20 for overall relaxation, and was able to add in Small Intestine (SI) 19 bilaterally to address her otitis externa. She tolerated GV 4 being added in, but would not tolerate anything caudal to Bai Hui. As such, I targeted BL 25 to address the urinary system as best as possible.